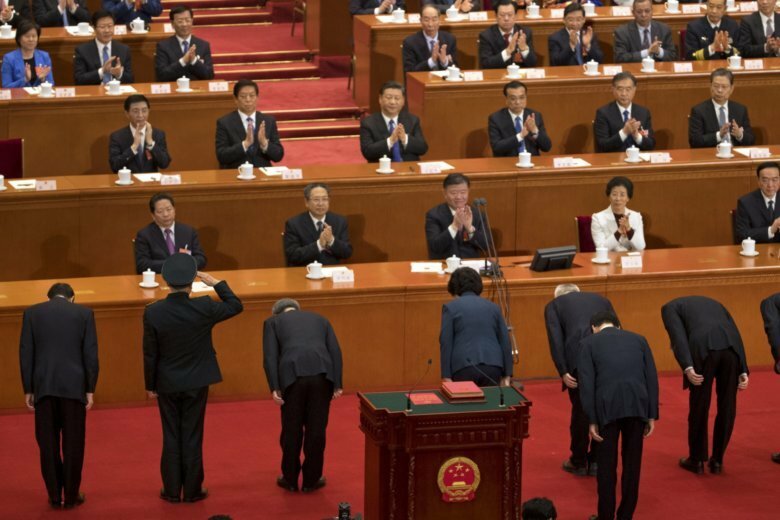 BEIJING (AP) — In a story March 1 about China’s National People’s Congress, The Associated Press reported erroneously the year that tax and charity laws were passed and the type of legislation approved in 2005. The Congress passed tax and charity laws in 2016, not 2007, and it approved an anti-secession law in 2005, not an anti-succession law. BEIJING (AP) — Thousands of delegates from around China are gathering in Beijing for next week’s annual session of the country’s rubber-stamp legislature and its advisory body. The event is more a chance for the authoritarian ruling Communist Party leadership to directly communicate its message than for actual debate or passage of laws. The session known as the “two meetings” provides an opportunity for party leaders to sum up the past year’s achievements and lay out their priorities for the coming 12 months. It also offers a rare glimpse of President Xi Jinping, Premier Li Keqiang and other top officials going about the business of governing Chinese style, as the world’s most populous nation faces challenges from a slowing economy to a radical decline in its birthrate. Here are some facts and figures about the event. As always, the 2019 session will include reports, speeches and media events, starting with Premier Li Keqiang’s lengthy Report on the Work of the Government, a sort of State of the Nation address, that kicks off the session on Tuesday. Reports will also be issued on the work of the Supreme People’s Court and the state prosecutor, the budget and the latest plan for economic and social development. The foreign and commerce ministers also meet with journalists, and the entire 10 to 11-day session ends with Li presiding over the premier’s traditional annual news conference broadcast live nationwide. This year, 2,975 delegates have been selected to sit in the National People’s Congress, the symbolic legislature, representing cities, provinces and regions from across China, along with the People’s Liberation Army. They are joined by 2,158 members of the legislative advisory body, the Chinese People’s Political Consultative Conference, which meets concurrently. Delegates, led mostly by retired government officials, can discuss proposals for legal and regulatory changes, but have no powers of enforcement. Rather than geographic regions, they generally represent social and professional sectors, including farmers, workers, government officials and professionals in the field of science, technology, business, finance, education, agriculture and entertainment. Ma is believed to be the richest delegate, with a personal fortune of $45.3 billion, followed by real estate developer Xu Jiayin, with $30.3 billion, chairman of automaker Geely, Li Shufu, at $14.8 billion Xiaomi’s Lei with $11.4 billion, according to Forbes’ 2018 data. Their wealth leaves U.S. politicians in the shade and has raised questions about China’s growing gap between rich and poor and the power of money within the county’s largely opaque political system, despite President Xi Jinping’s ongoing campaign to root out official corruption. They include a 2018 supervision law that sought to facilitate the anti-graft campaign; general provisions of the civil law in 2017 that laid out the first such guidelines since the founding of the communist state in 1949; tax and charity laws in 2016; and the 2005 anti-secession law that laid down the conditions under which China would attack Taiwan, the self-governing island democracy it claims as Chinese territory to be recovered by force if necessary.